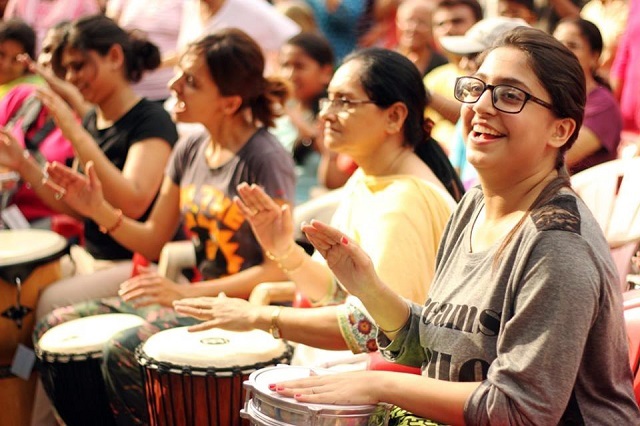 Now in its fourth week, Mumbai’s Equal Streets movement has given citizens the opportunity to reclaim their streets as public spaces for people. Photo by Mansi Jain/Facebook. Linking Road is known as one of Mumbai’s busiest streets. On any given day, it is choked with cars, taxis, buses, and rickshaws from every possible direction. In addition, noise pollution emanating from motorized vehicles has made the environment increasingly stressful. Suffocated with this congestion and pollution, Mumbai has been gasping for a breath of fresh air. It has become a rare sight to see a child cycling to school, even though this was a popular mode of transport for many children less than two decades ago. 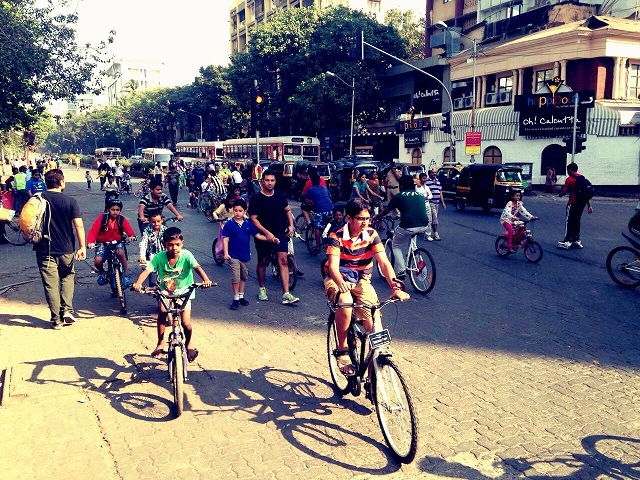 For the past four Sundays, however, it has been absolutely refreshing to watch Mumbaikars reclaim their streets. 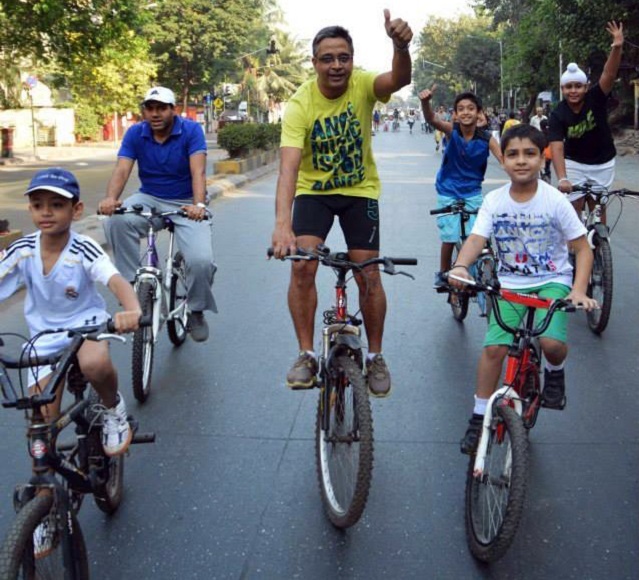 It is a delight to see the city’s children have the opportunity to actively enjoy open streets every Sunday, away from their indoor video games. Photo By Priyanka Vasudevan/EMBARQ India. 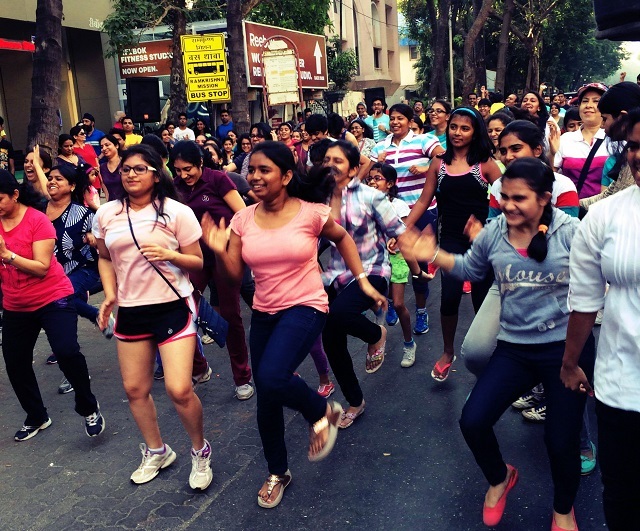 Since Equal Streets was launched in Mumbai on Sunday, November 9, 2014, nearly 40,000 Mumbaikars have joined in the celebration of open streets. 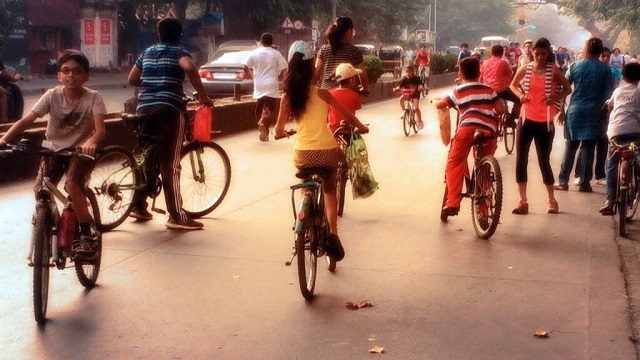 The number of cyclists is increasing every Sunday, bringing Mumbai a step closer to the initiative’s larger objective of creating streets for people, not cars. Photo by Sachi Aggarwal/EMBARQ India. The level of excitement at Reebok’s Zumba stage is palpable every Sunday. Photo by Sachi Aggarwal/EMBARQ India. Equal Streets – A Citizens’ Movement has changed the thinking of thousands of people, and it is only the beginning. The Morning Drum Circle at Equal Streets highlights the new ways people are using public spaces when cars are not present. Photo by Pooja Sharma/Facebook. 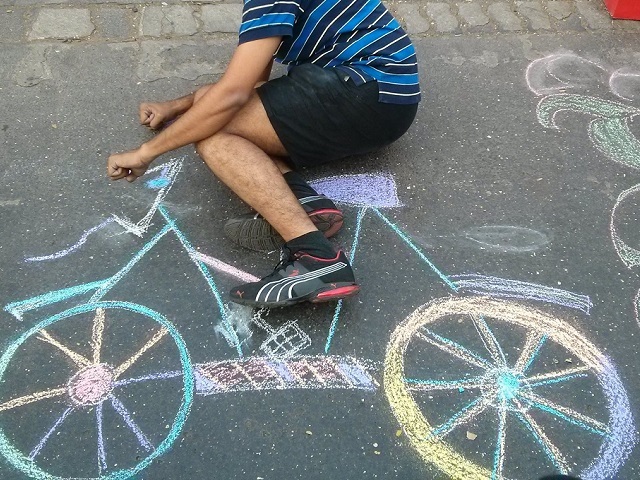 Every Sunday morning, the streets are filled with residents – cycling, performing yoga, dancing, playing football or cricket, rollerblading, or even enjoying Carrom – a local board game. 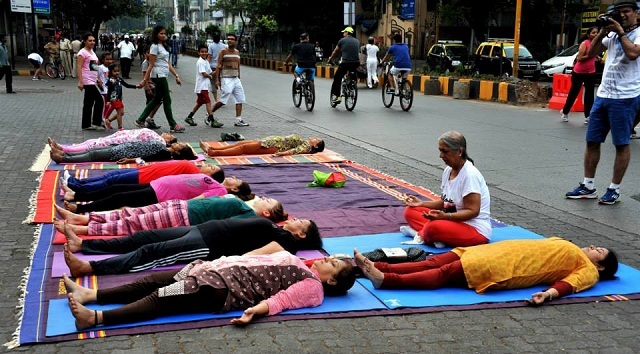 People practice yoga on the usually chaotic and congested Linking Road at Equal Streets in Mumbai. Photo by Zubin Gheesta/Facebook. 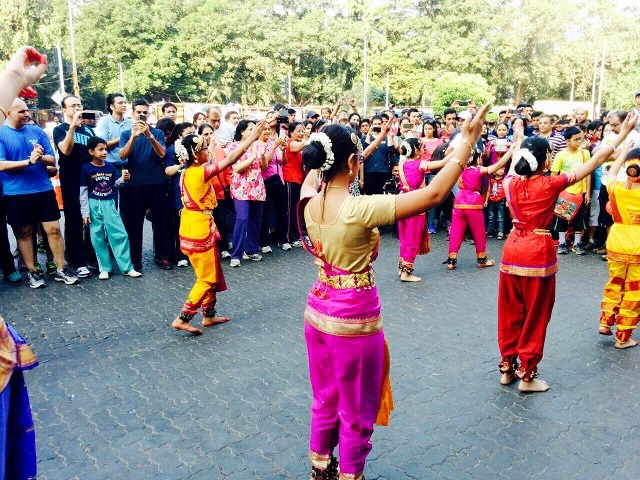 A flash mob partakes in a beautiful fusion of Bollywood and the Indian folk dance Kathak on the inaugural day of Equal Streets. Photo by Priyanka Vasudevan/EMBARQ India. 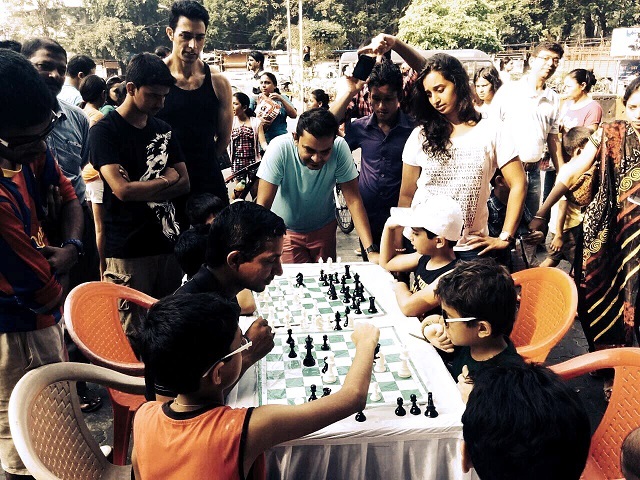 Kids and adults enjoy a comfortable round of board games right in the middle of the street. Photo by Priyanka Vasudevan/EMBARQ India. In the coming weeks, Equal Streets is working towards launching campaigns around urban tree cover, climate change, and other environmental issues, hoping to make this initiative an even stronger community movement. A street performer attracts a crowd of people during her hula-hoop act. Photo by Anil Patel/Facebook. People of all age groups take advantage of Equal Streets. Photo by Priyanka Vasudevan/EMBARQ India.